This editorial examines the strategic importance of Apple's iOS in the Car, following up on two earlier segments: the first detailed the origins of iOS in the Car and how Apple details it will work, while the second examined the competition Apple faces in automotive and why it's pushing so hard for an immediate launch next year. Will Apple become a Microsoft, an Android, or stick to being an Apple? In keeping with the company's secretive licensing terms for its Made For iPod (MFi) program, Apple hasn't released public details about how it plans to sell iOS in the Car. Will it be a strictly licensed specification, similar to how Microsoft markets its Windows software and PC reference designs? Apple hasn't done anything like this with a major product since its efforts in the early 1990s to license Newton OS for tablets and the classic Mac OS for white box computers and set top boxes (like the Bandai Pippin, below). Steve Jobs terminated both licensing programs in 1997 because they didn't make financial sense. Alternatively, will iOS in the Car be a loose set of technologies for companies to integrate on their own, similar to Android? Apple last gave away an alternative, open source operating system in 1998: mkLinux. And while Apple now maintains and distributes several large scale free and open software projects including WebKit, CUPS, LLMV and LLDB, these projects are all, like Android, strategic rather than directly profitable. Alternatively, will iOS in the Car be a finished product carmakers must integrate into their vehicles? The most recent significant example of Apple providing a product for third party resale is likely its short-lived 2004 partnership with HP to sell the rebranded HP+iPod. 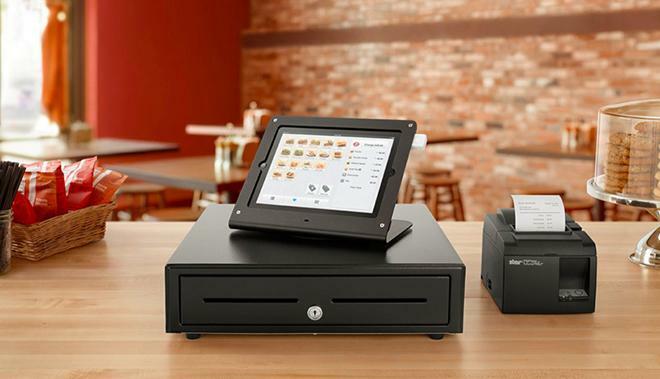 However, a number of third party Value Added Resellers have jumped upon integrating existing iOS devices in custom applications, from cash registers to interactive museum kiosks. And Apple already prominently works with a wide range of third party VARs that support aftermarket iPod car integration. Upgrading these VARs from their existing AiR or iPod Out solutions to full support for iOS in the Car features built around, say, an iPad mini, appears to be a moderately large opportunity in itself for the huge audience of drivers worldwide who aren't in the market for a new vehicle next year. Apple clearly loves making its own, fully optimized and highly integrated hardware products, and doesn't seem at all eager to shift its winning strategy into a broadly licensed software model like Windows or Android. Doing so would have limited financial upside, and expose Apple to the same sort of platform fragmentation and finger pointing integration accountability issues that plague Android and Windows. Over the past decade, Apple has passed the rest of the industry so decisively that Microsoft and Google are now shifting their open platform strategies into reverse in this regard: both are working furiously to build their own Apple-like first party hardware, from Microsoft's Xbox, Zune, KIN and Surface to the smartphone, tablet, netbook and TV products floated under Google's Nexus, Motorola and Chrome brands. 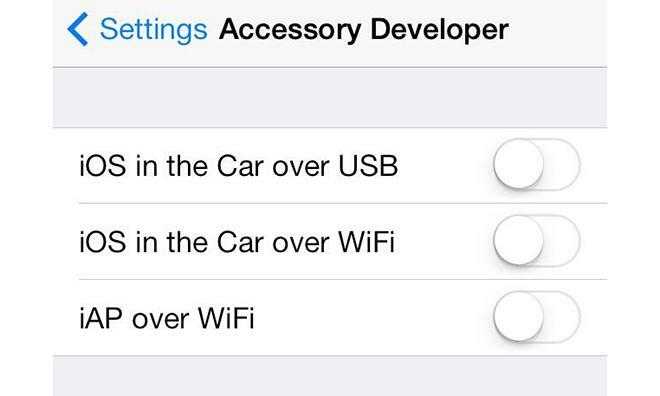 What's under the hood of iOS in the Car? iOS in the Car is somewhat new territory for Apple, a significant evolution of its MFi program. 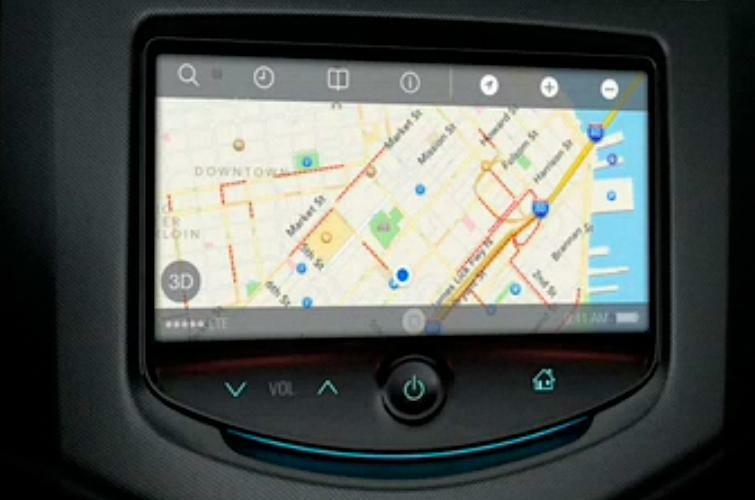 While last year's Eyes Free initiative only asked car makers to invoke Siri remotely through, essentially, a Home button on the steering wheel (shown below, and in the new Chevy Sonic ad promoting Siri Eyes Free at the top of the page), the custom touchscreen interface Apple depicted for iOS in the Car appears to involve a more substantial installation capable of running iOS itself. The question nobody has really asked and Apple hasn't explicitly answered is: does "iOS in the Car" mean you can use iOS in your car, or does it mean iOS is actually installed in your car? It's certainly possible that Apple could simply be asking car makers to adopt an iOS-style user interface, which could conceivably be hosted on top of their existing infotainment systems. This would have something in common with the original iPod in 2001, which put an Apple-like user interface on an embedded Linux device, complete with the original Charcoal system font of the classic Mac OS. However, Apple's come a very long way since 2001. In 2006, when rumors of a possible "iPhone" first began to swirl, I received some rather contemptuously caustic feedback from one reader on my suggestion that Apple could be working on using OS X to develop its own smartphone platform. Hindsight makes it seem pretty evident that Apple isn't interested in being a bit player on top of some other OS: iOS in the Car must actually mean iOS is in the car. In her opinion, it made much more sense for Apple to simply layer an iPod appearance on top of the openly licensed Symbian smartphone platform then being jointly run by Nokia, Sony Ericsson and NTT DoCoMo. Why would Apple dare challenge the awesome power and entrenched influence of the veteran mobile industry Goliaths? A decade before that, there were many pundits scoffing at Apple's 1996 plan to acquire Steve Job's NeXT in order to build OS X, rather than just licensing either Windows NT from Microsoft or acquiring BeOS in order to update the technical underpinnings of the Mac platform. If Apple has licensed Windows in the 1990s, as Microsoft had urged in initial negotiations, it likely wouldn't have survived long enough to have gone out of business as a Symbian smartphone licensee a decade later. That hindsight makes it seem pretty evident that Apple isn't interested in being a bit player on top of some other OS: iOS in the Car must actually mean iOS is in the car. Given that today's automotive infotainment systems are often plagued with end user complaints of core software systems that are difficult and expensive to update, unresponsive screens and other symptoms of cheapskate hardware, and given that there is not a widespread, common automotive hardware platform to install iOS upon (similar to the standard Intel x86 PC architecture Apple readily adopted for new Macs in 2006), it makes sense that Apple could be planning to build its own hardware components for automakers adopting iOS in the Car. This could involve an embedded Apple A6-powered automotive hardware module that Apple could support as a user-upgradable product, and that integrates with car makers' existing wiring harnesses, proprietary hardware controllers (like BMW's iDrive shuttle navigation device), vehicle information systems, rear cameras, heads up displays, climate control systems and a dash-mounted touchscreen display that meets certain specific criteria. Apple could also go a step further in essentially selling automakers a car-customized iPad, given that even the most high end models of Apple's tablet cost much less than cheapest automotive navigation and infotainment options on new vehicles. However, manufacturers are likely to prefer to exercise more control over the way a display is integrated in their vehicle, making the concept of a "headless" iOS module easier to quickly integrate in their existing vehicles, given that Apple is pushing for this to begin as early as next year. Basing iOS in the Car on such a "iModule" would strike a balance between Apple's core competency in designing and building high volume, low cost devices, while still allowing automakers to experiment with differentiating features. Many existing automotive systems already use such an ARM-based controller, such as the Continental modules that power Ford Sync. They're just not intended to be upgraded with periodical replacements. Basing iOS in the Car on such a "iModule" would strike a balance between Apple's core competency in designing and building high volume, low cost devices, while still allowing automakers to experiment with differentiating features supported by custom apps and employ various degrees of economy or luxury to match their vehicles. With the rapid pace of advancement in mobile device hardware, Apple could add the car to its list of regularly upgraded products (iPod, iPhone, iPad, MacBooks) it markets to consumers in new editions each year. Leveraging its vast economies of scale, Apple could profitably sell replacement car iModule upgrades that keep drivers' vehicles up to date and increase their cars' resale value. Outside of the car, such an iModule could also have broad applications in other industries as a cheap way to give appliances and industrial equipment a general purpose, upgradable brain that would be easy to extend using iOS app development tools. Such a strategy would resemble the company's ongoing string-pulling hobby of Apple TV. Despite years of predictions that it would either enter the TV business or license its Front Row or Apple TV interface to existing TV manufacturers, Apple has plugged along simply selling standalone Apple TV units that end users plug into their existing TV. Sales of Apple TV have grown from initial, experimental quantities to now reach 1.3 million in quarterly unit sales. That's as large as Apple's entire Mac business was in the corresponding quarter of 2006, the year the company first unveiled the set top box. Seven years of Apple TV later, the company hasn't given even the slightest public hint of being interested in embedding Apple TV or its user interface in third party sets. At the same time however, Apple has been licensing one of Apple TV's killer apps: AirPlay. Through its MFi licensing program, Apple lets third party hardware makers support the audio-only functionality of AirPlay (as it has since its previous incarnation, AirTunes) into their products. It still hasn't opened up access to AirPlay video, however. This suggests that Apple would rather retain exclusive ownership of AirPlay via its own hardware rather than earn any amount of licensing revenue from potential partners. Why? Given that iOS 7 appears to support new AirPlay features related to iOS in the Car over USB and WiFi alongside iPod Accessory Protocols features, Apple's reluctance to license may be due to its interest in owning the hardware iModule business.